I think its incredible how sports bring together people from all over the world. Its heartwarming to imagine that someone who lives on the other side of the world feels the same way you do about something. It opens up avenues for people forge friendships and exchange experiences. 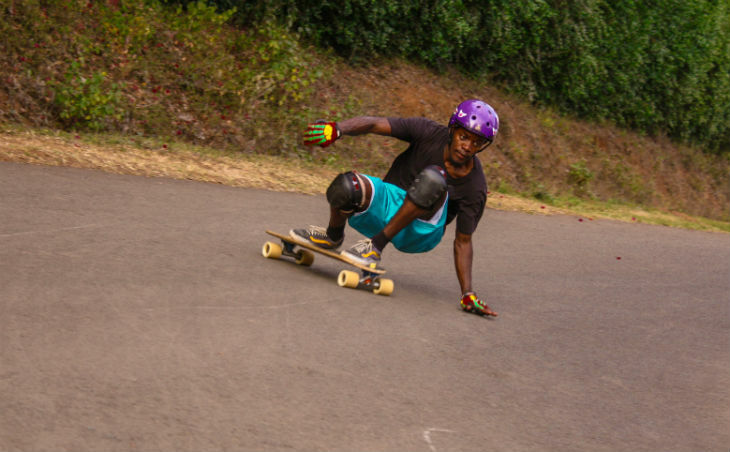 My name is Abuga Aroni and I am a longboarder based in Nairobi, Kenya. I’ve been skating for about 2 years now. I absolutely love it and I hope I’ll still be skating in 50 years. How did you pick up the sport? I was studying in the UK for a while and I got a cruiser board to get around. From their I learnt to power slide and fell in love with going down hills. I then bought a bigger board cause I wanted to push my skills and take it further. My passion for this sport has only grown since – and my wallet has also grown lighter. 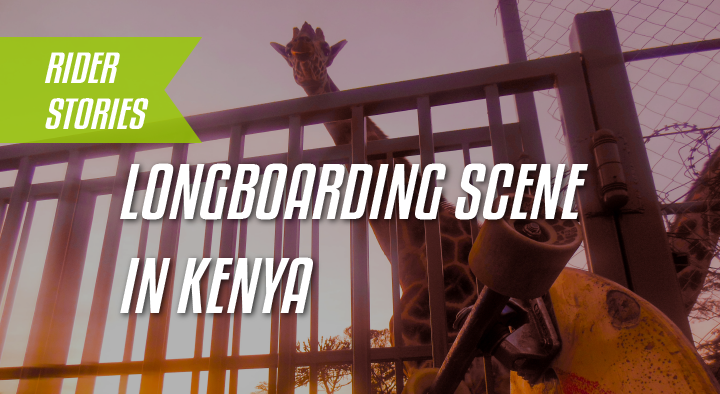 Whats it like skating in Kenya? I’m the only longboarder I know of in Kenya. It can get a bit lonely but its alright. Longboarding for me has always been a personal thing that I can do alone. Its my therapy, my release, meditation etc. 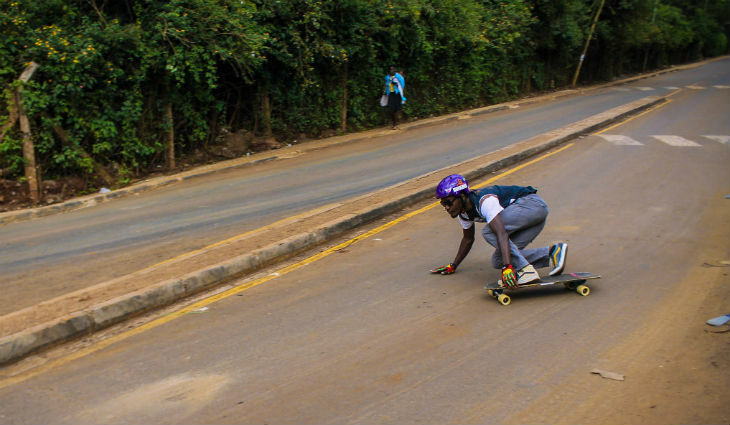 Longboarding is very new to Kenya. People are very surprised by how I fast I can go, how I stop and how confident I seem on board. All these things have come with practice and experience and I’ve definitely had a few falls and injuries along the way. The one question I always get asked is “Are you not scared of falling?” and ofcourse I am! But I am confident in my abilities and I always skate within my limits. Needless to say, locals are very stoked on watching me skate. Its not something you’d expect that someone could do on a skateboard. The weather can be pretty bad sometimes. Skating between 12pm and 2pm is a bit risky because it can get really hot. Otherwise its usually perfect. Skating in the mornings is incredible. The roads here aren’t too bad. The government recently hired Chinese companies to redo a lot of the major highways and by-passes. So we have a lot of new untouched roads. There is a skate scene that is still growing. It has a lot of potential and its amazing to see people trying to make it work. It gives me hope that we will have a big longboard scene one day. Otherwise its pretty much like anywhere else. People are stoked to skate and we make it work. Equipement is hard to come by. Investing in long lasting products is key. I have to rely on people coming in from abroad to get me equipment, so gear is hard to come by. Unfortunately most longboard products come from developed countries and are priced accordingly. Its hard for young people here to be able to afford it, our minimum wage is less than $100. Unless you have a proper job, buying quality equipment and shipping it here is a bit of a challenge. Its a bit risky with the drivers here, a lot of people don’t acquire their license properly. Most people with license haven’t been tested well. I remember my driving test was one question and 40m long drive on a straight road. We all had to bribe the instructors too. So I have ZERO confidence in most Kenyan drivers haha. Have I ever been hit by a car? No. Have I had a few close calls? Yes: There are these people who use their motorbikes as taxi’s and they are the worst. Most of them don’t even have licenses and safety is an after-thought. I’m excited for the future. I have a unique opportunity to show Kenyans what this sport is about and provide young people something to get excited about. Hopefully along the way we can figure out how to make it work. Yeah people are stoked for it though and there is a lot of potential. If we had equipment at relevant prices, the sport would explode. I ask myself why I picked this sport but you don’t pick what you love. I’m just grateful to have something to be excited about. Life without something to fight for, despite the challenges it has, seems bleak. Sorry to get so deep haha.